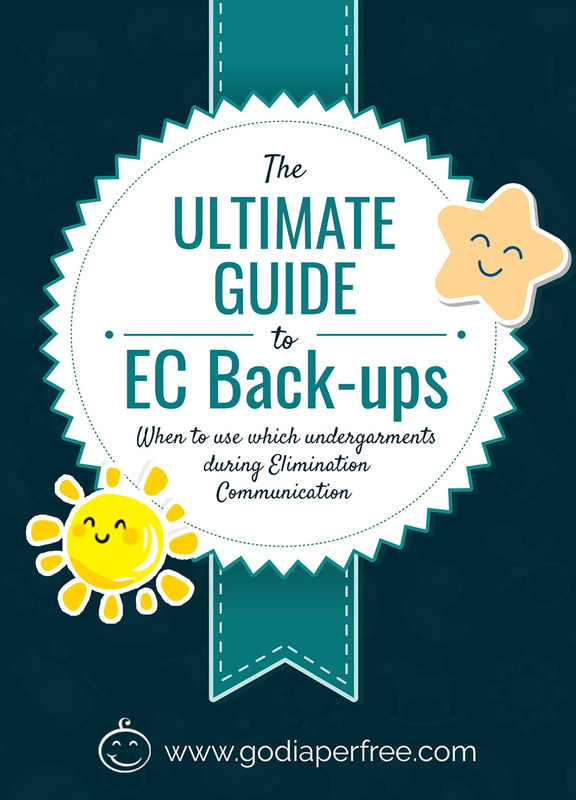 When beginning Elimination Communication with a baby or young toddler, you may be wondering what to expect as far as back-ups go. Which types of back-up can you choose from? Which are appropriate when? Which will help your baby learn the *most* at which ages and stages? An elimination communication "back-up" is what you clothe your baby's bottom in to support toilet learning, keep baby comfortable, maximize the sensation of feeling wet, maximize baby's independence, and keep your floors and their clothing dry (when that's important). Back-ups can range from a disposable diaper to completely naked, from cloth pull-up covers to tiny underwear. 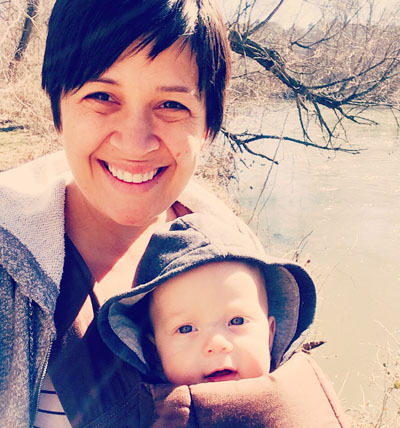 "Those of you with older babes or who've been through this once before: when did you ditch diapers and just do training pants or undies all the time (or at least all the time during the day)? Why did you pick that time? Would you do it the same again? I feel like we’re ready with my 11 month old, during the day at least, but he’s on the verge of walking so was thinking once he hits that milestone, diapers only for sleep. use whichever backup helps baby signal the most clearly, helps you stay the most sane and calm, keeps baby the most content, and helps support baby's current developmental activities and independence best. When doing EC, the diaper is no longer his or her primary toilet. It is now considered a "back-up." You must shift your perspective to using the diaper as a "back-up" for when you are not on it, when baby is not on it, when baby is sick, when it is inconvenient to potty baby (like while traveling), or for accidents and emergencies. If you are toilet training your toddler, the diaper is immediately removed from the picture during the day. 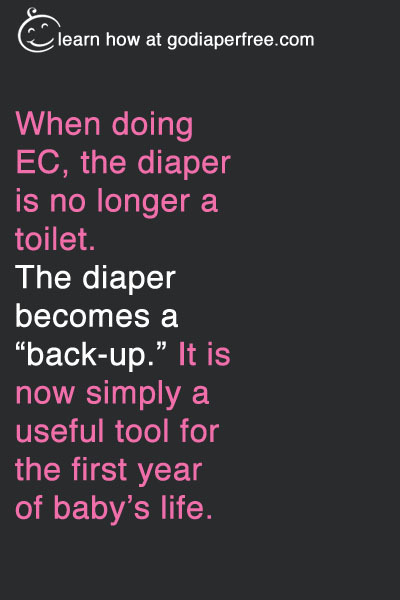 If you are not night training alongside daytime, you will likely still use a diaper at night, but as with EC, the diaper is now considered a "back-up," not a full-time toilet. I highly recommend using cloth diapers from birth, if you are able to. Don't let this overwhelm you by thinking it has to be complicated: you can just fold the insert into 3rds and lay it inside a cloth diaper shell (or use an AIO system that has a shell and an insert laid on top of it - not stuffed) and then snap or velcro that baby into place for easy on's and off's. No need for snappies or pins. Some folks like to use only a cotton prefold with a snappie, no cover. Some will use a "workhorse" which is just the inside part of the cloth diaper fastened to itself thru sewn-in velcro or snaps (or held together with a snappi or pins). You can also do "sumo style" (below) with a diaper belt holding a prefold in place, as described in my book. Many options. If there is a cloth diaper service in your area, please hire them! Ask a relative to give you at least 3 months of service as a shower gift. The reason I recommend a cloth diaper service (vs. washing yourself) is that you are going to have a lot of diapers that only have one tiny "shart" (what we call a wet fart in our household) on them, and those will have to be laundered. You will be catching a lot of pees and poos in the toilet at the easier-to-EC newborn stage. Those shart diapers can be so annoying, and overwhelming...so do yourself a favor and have someone else launder them. If the cloth diaper is rubbing against baby's umbilical stump prior to it falling off, you may want to use a newborn disposable diaper for the first 2 weeks (the ones that have the little cut-out for the cord). If the cloth diaper is giant on your tiny baby, and you just can't get it going, use disposables for a spell. The disposable question is an important one. I have personally used a mix of cloth and disposables with my babies. Again, we go back to the overall guideline: what does baby signal best in? Personally, my first signaled best in cloth; my subsequent 3 babies have signaled best in disposables. I have *only* ever used Seventh Generation Diapers...they are fairly leak-proof but they do feel pretty wet after baby goes, and most babies do not like how it feels so will avoid peeing in them. When to stop using disposables if you get into that rhythm and feel too comfortable with them? Stop using them when you feel guilty about using them. Stop using them when you notice baby is starting to feel comfortable peeing in them (ie: doesn't mind at all). Stop using them when baby stops signaling well in them. In fact, no matter which backup you choose, when baby begins to feel comfortable in them and stop signaling (or you guys get way off track), that is exactly when to (1) change back-ups or (2) stop using diapers altogether. I've heard too many stories from people in our EC circles where the mom said "I should have stopped using diapers at about 12 or 13 months, but I waited til 17 months to be a little more child-led. It was a huge mistake and I am certain that this is why she is resisting, regressing, and not wanting to keep her pants dry." In 1957...92% of babies were toilet trained in the US by 18 months (not an average...this is when this many babies were completely done with the whole process). So it is wise to give up diapers between 12-18 months, at the very latest, and to begin working on wrap up after baby begins to walk well on her own. Okay so let's get back to ages now. 3. Babywearing as a "back-up"
One more thing I'd like to note about the newborn age is that in remote civilizations and intact cultures, most babies are worn in a baby carrier (this is my fave) for the first 3 months or so, during the majority of the day. When laid on the ground, they are free to move and wriggle and find their mobility, themselves (a concept championed by Montessori). But during most of the day they are engaging with mother or father's world thru being in-arms/in-carrier. This is great for EC! You will either get a squirmy, fussy baby signal or a warm/wet sensation (ghost pee) as a signal to let baby out of the carrier and offer the potty (point and shoot). If you're babywearing a lot of the day, or during an outing, or around the house, you can choose to have your baby in a back-up or not - you are less likely to have misses, so consider this option if it works for you. Again, if a baby freely pees without a signal in *any* backup, it's probably time to change that backup to something more effective. For newborns at night, you'll typically want to use the same thing you used during the day. I will explain by sharing examples from my own children. With my first, I had the cloth diaper service, so he slept in cloth. I also co-slept with him and pottied him/nursed him at every wake-up - approximately every 2 hours for 2 years - so I probably caught 50/50 in the nighttime until he moved to his own bed at 24 months. After the 3 months of cloth diaper service ended, I used a hemp/cotton prefold folded into 3rds inside a wool diaper cover. I never experienced leaks. He was dry at night by 26 months. With my 3 youngest babies, I've chosen to use a Seventh Generation disposable diaper backup at night. Why? To help them sleep better. You see, with these 3, I chose to "sleep train" - which basically means to teach them how to connect their sleep cycles. I co-slept with these 3 babies for the first 4 months and then moved them into their own floor bed or crib in a separate room, with a baby monitor, and began to teach them how to sleep. How did I do it? Well, I used a custom sleep training plan from the Baby Sleep Site. It is not CIO (cry-it-out) and it really did serve to improve these 3 babies' moods and daytime energy levels. I would recommend using the sleep teaching methods found at the BSS - custom or quick version - whenever you feel you need it. With my youngest, I needed it right at 3 weeks old! Full permission granted. But, yes, disposables did help with sleep training - and often my babies came up dry despite the back-up. For me, it worked. My two middle children were dry at night at 26 and 26 months. So, the nighttime back-up choice for a newborn, in my unscientific experience, generally does not impact the length of time to night dryness. What about nighttime elimination communication, then? As for nighttime EC, I did do it with all 4 of my babies but for the last 3 of my children I did this: for the first 3 months while they were newborns and in need of highly-extra-special-responsive baby care, 24/7, I did nighttime EC all night while cosleeping, then I moved them into a crib in the room or a floor bed at 3 or 4 months old, and all the while used disposables at night with them to help them sleep. Again, often they awoke dry. In conclusion, using cloth diapers with a newborn, 24/7, is best to keep baby sensitive - and to keep YOU motivated to wrap it up at earlier and earlier ages. However, use what makes the most sense for you, knowing that - if you use sposies - you'll probably cut your disposable diaper usage down to 1/3 of what those who do conventional potty training use...so it's still a big win. 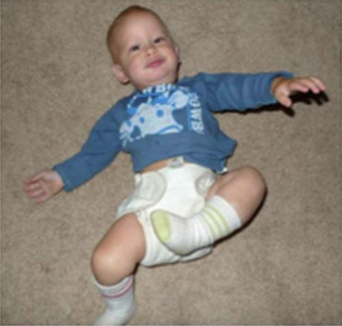 When baby begins to roll over around 4 months of age, which marks the beginning of mobility, she will often stop signaling as strongly. Alternatively, the signal changes or becomes more subtle, and baby begins to focus all efforts on getting that basic roll over (and roll back the other way) developmental task. During that time we support baby's budding mobility by giving diaper-free time as often as possible. But, wait! What is diaper-free time? Diaper-free time means spending some time with baby dressed in something other than a diaper. It can be naked time, time in undies or trainers, or time in split pants. I like to do diaper-free time with my Tiny Trainers line of training pants, which come in size 6 months and up. You can see when they are wet and change and offer the potty immediately - and they allow ultra-mobility and flexibility to support your baby in tackling this mobility task. During other times when you're more distracted or diaper-free time is inconvenient (ie: when you are cooking, or on an outing, or when baby is in childcare, or while baby is napping), you can use a diaper back-up of your choice. Again, use the overall guideline of whatever works best. Switching back-ups at different times does not confuse the child, but I would suggest being consistent with the times you use a certain back-up so baby can learn the routine. ...some of my readers have completely ditched diapers at 5 months old because they were able to stay stress-free and calm during misses, were able to be very responsive to their babies, and had wood floors (!) so cleanup was fairly easy as well. They also had my Tiny Trainers which truly make a difference in completely ditching diapers at this young age. The "con" to this is that if you have a poop miss, it is a crazy messy cleanup. If you have a full pee miss, it is often hard to pull the wet training pants off (kind of like pulling a wet bathing suit off a child). I've developed a new product, TinyUps, that solves part of this latter conundrum: they have a bamboo fleece lining and 3 snaps on the sides, so removing them is super easy. You can pair them over Tiny Trainers or Tiny Undies, or you can use them solo (although they do not catch much of a pee and will leak with no additional trainers/undies inside, they are fantastic for just being around the home with a poop-trained baby). Also, a baby in this pre-mobile stage, in any natural environment where there are no diapers or much clothing, would just pee and roll away from the pee. Newborns even do this when they "crawl" in the bed while sleeping, after waking slightly to pee. Human instincts are so strong. And, thus, signaling comes to a halt with most 4 months old babies. Which leads to the next developmental task: sitting and crawling. you will likely have more misses during this phase, as baby is on the move, developing rapidly, and in a natural environment would not longer need your assistance to pee in an appropriate place. When your baby begins sitting unassisted (or trying to do so), there may be a bit of distraction. This is their developmental focus at the moment, and they become single-focused on it. Again, think about it: in a natural environment, baby could pee and then move to the side if sitting or trying to sit, so many do not signal because why would they need your help at this stage? They can do it themselves (again, IF in a natural environment with no bottoms on and warm weather out). So, the backup will need to be adjusted (or understood) accordingly. Wait! We say as we rush him to the potty to help him finish there (which he often does - 1/2 or 3/4 catch, and lately a full catch). It's ok to pause mealtime for a potty break, especially when it's for a poop, just be sure you have a hand towel nearby to clean up hands and face before you whisk baby off to the potty. With my first, EC did take a small backslide during the week when he was learning to crawl (belly off the ground). We had the only week of poop misses in his entire babyhood: during that week. I responded by being more vigilant and staying calm, staying the course, and within a week we were back on track. We were using cloth diapers at home...and we stayed with it. When your baby begins crawling, or is working on that developmental task, misses can substantially increase. At these times it's important to dress baby in a back-up that keeps you calm and continues to teach your baby. How to stay calm? Just by remember this: stick with it, and it will pass. During this time we often change to a toilet seat reducer. Babies escaping mini potties? Not fun. Not productive. Very frustrating, indeed. Then we get into pulling up to standing position. At this time (or maybe before if you're lucky), baby often begins resisting diaper changes. In fact, way back at rolling, baby probably was already "resisting" diaper changes by wanting to roll instead. It is almost reflexive. At this point it is helpful to begin teaching baby to sit on the potty by placing it behind her legs and asking her to sit while she is pulling up or standing unassisted, balancing. Back-ups at the pulling up to standing and "creeping" along furniture (and you) stage should again be whatever is most effective on the most levels (see the overall guidelines again). However, if you're having a major diaper-changing war at this age, you can change to Tiny Trainers or TinyUps (or a combination of both) and have a much easier time changing baby standing up. Use a cover, like my TinyUps, if you wish to also protect the pants, or use TinyUps solo if you're just around the house and it works for you. Pair either with some BabyLeggings (use my code GDF16 for 5 free pair of legwarmers!) and maybe some socks or booties like these by Hudson...and baby will stay warm, you will see when she's wet, and you can change her standing up. I definitely recommend Tiny Trainers and TinyUps at this age IF your baby is mostly poop-trained, or if you know her poop timing well enough. Often the trainers will enhance signaling and learning, dramatically...and will keep you more aware of signals (because there is more at stake!). If you are cloth diapering at this time, you can use a sumo-style cloth diaper back-up - which is simply a tri-folded toddler-sized prefold cloth diaper or insert which is held in place with a diaper belt. This is good for observation time (get a log here), getting back on track, and easy stand-up diaper changes while you both are learning (or feeling lazy). I like to use a burp cloth instead of a cloth diaper, held in place with a diaper belt, because it is much easier to see when baby is wet. Your choice! During all this, if baby is cutting a new tooth, is ill or becoming sick, or anything else is changing inside her body or outside in her environment, potty behaviors may change. Perhaps an increase in misses, perhaps resistance to pottying, perhaps poop misses where before you never had 'em, and perhaps you catch way more (diarrhea especially) because baby is sick. Bottom line: bodily and environmental changes affect EC, and vice versa, and you should adapt your back-up choice to whatever works best in these situations, as they arise. When baby is about to start walking, things can either get better or worse. Again, remember that it's temporary. And it's all part of the learning. the backup for this brief pre-walking time is not as important as the backup you choose once walking has been mastered. I generally recommend that you transition to Tiny Trainers and/or TinyUps as your baby's primary daytime back-up once she masters walking. It is developmentally inappropriate to change a baby's diaper laying down at this stage of walking mastery, per the Montessori school of thought. I would have to agree (because: the diaper struggles at this age!). Once baby is walking, change him standing up, and engage him in the process of changing the bottoms when they are wet. At this stage it is not important how many wet bottoms you go through per day. In fact, I would keep 18 pair of Tiny Trainers and/or 8 pair of TinyUps in your child's wardrobe at all times so you do not stress about running out. using *only* cotton training pants starting at age 12 months (or earlier, if walking earlier) enables the child to learn much more quickly and deeply than using a disposable diaper or waterproof (PUL-lined) training pants. I have observed the same. In any case, if you aren't using split pants/chaps and if you don't want to move from diapers to trainers, consider moving from diapers to undies. Let me explain. If you find that Tiny Trainers/TinyUps don't work for you (ie: your baby pees in the training pants all the time and does not signal or make an effort to go to the toilet, or you are just not on the right timing and missing every single pee and poo, AND it is stressing you out - again, it may not be an issue as they are learning - but you, the parent, are stressed out), then moving to Tiny Undies would be advisable. In this case it is likely that the training pants feel too similar to diapers, and making a move to something that does not feel like a diaper is a good choice. In any case, I would definitely encourage switching your daytime back-up to training pants upon walking mastery, for sure, and earlier if you have a good handle on poop catches or at least poop timing. Again, to protect pants, use TinyUps cloth pull-up covers over the Tiny Trainers. They will not hinder the learning process. To protect the floor, often Tiny Trainers alone are enough, but all babies differ. I've noticed that babies pee straight thru Gerber training pants because they are subpar quality and have a polyester core that is terribly in-absorbent. You can also double-up training pants for extra protection, but buy one set of trainers two sizes up in this case so baby is still comfortable. However, if you are using this thick of a training pant, you may want to consider working on your EC practice so you don't have such big misses. To recap, some babies will move straight to Tiny Undies upon walking mastery and will do great. My second (our daughter) did exactly this at 13 months old. By 15 months she was telling us every single time she had to pee or poop. We did terrible at EC from months 4-8 with her, got back on track at 8 months, ditched diapers and went to Tiny Undies at 13 months, and by 15 months were completely graduated. Again, undies feel like the opposite of diapers and will be very affective with some children. When on outings, you can cover Tiny Undies or Tiny Trainers with TinyUps cloth covers and protect the pants/carseat while out and about. Learn more about EC on outings here. If you're using just undies or commando at home, and you've got to make dinner or are otherwise unable to quickly respond to your baby, temporarily use a pair of Tiny Trainers or TinyUps so you don't teach baby to pee on the floor (and don't have to clean up). You're not using this thicker back-up as a toilet, but as a little more protection during a time when you're not as available. No matter how you get there, moving to Tiny Undies by 15-18 months is advisable. If you don't have luck with it, 2-3 weeks in pants-only ("commando"), or without pants, around the house can be very effective as a transition into full-time undies. If you do well without pants at all, at home, then do it for as long as you need to! If it works, and your child uses the potty voluntarily when bottom-less, do it. It will not permanently stay that way. When you feel it is time to start using pants, teach your child how to push them down and pull them up. Have an older child demonstrate, use the instructions in my books, or use the videos that my daughter made for your child, found in my potty training book private book owners' website. IF your child pees wherever, whenever, I do not advise bottomless at home. In that case, do a potty training experience with my book and get the idea across, very clearly and gently...physically...that all pee goes in the potty, every time. But, if you have a child like my 3rd, Cooper, you will want to use Tiny Trainers much, much longer. We took him out of diapers at 17 months and then moved him into Tiny Undies. He is soooo lax and laid back. However. I *would have* ditched diapers with him sooner, I was just too overwhelmed with 3 kids, and being pregnant - you do what you can. In undies, Cooper peed thru them all the time and it drove us nutso. So we switched to Tiny Trainers and put a cloth diaper cover over them (my TinyUps weren't out yet) and sent him to preschool like this, with instructions for the teacher on how to potty him - and 3 extra sets of trainers and pants and socks in a wet/dry bag, just in case. We used the Trainers til about 25 or 26 months in the day with him, and now are just in Undies during the day, TinyUps at night. Now, at 29 months, he is completely dry day and night. 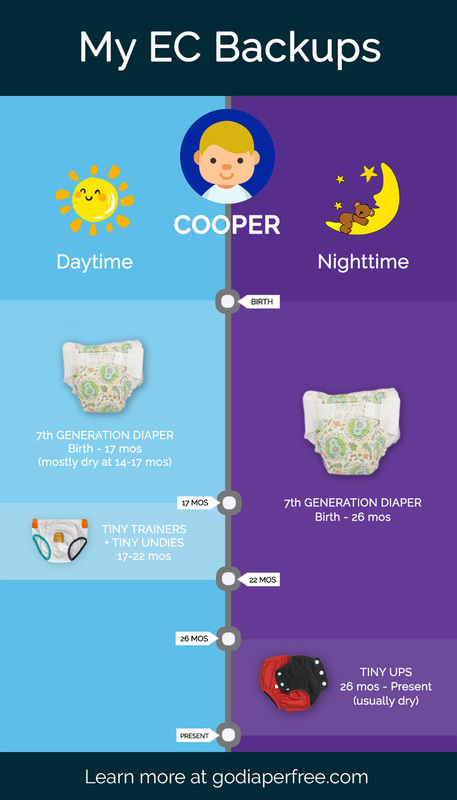 Had I ditched diapers around 12-13 months with Cooper, I know we would have had an advantage. But...case in point, you do what you can with what resources you've got at your disposal. It's all good. So the above are some examples of what you can do, too. I hope you found them helpful. use whichever back-up works best for this child (and this family) going through this milestone at that time. During growth spurts and developmental leaps, babies really need their sleep. The unfortunate truth is that EC can disturb sleep during this time, as can wetness. 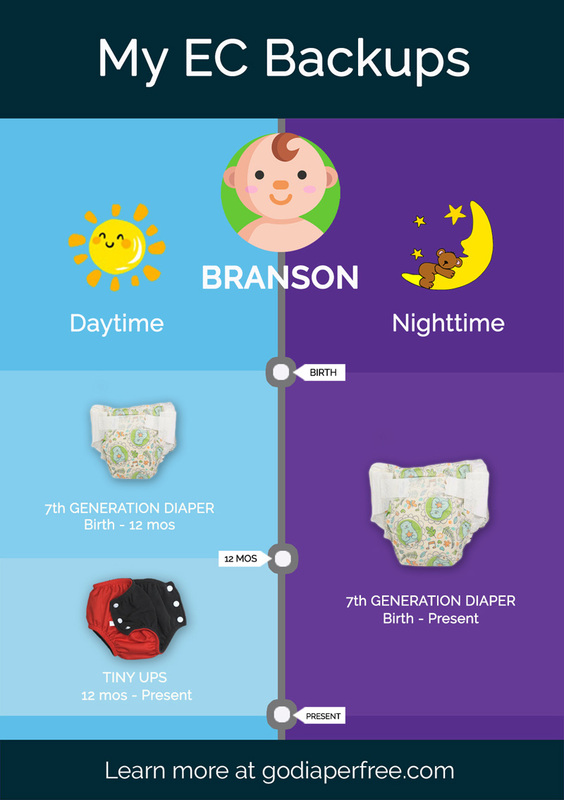 So, your back-up for nighttime EC can and will change over time, as well as whether you potty your baby at night...depending on what your baby is going through. Use what works, even if it doesn't feel like EC. No guilt. We all do what we can. 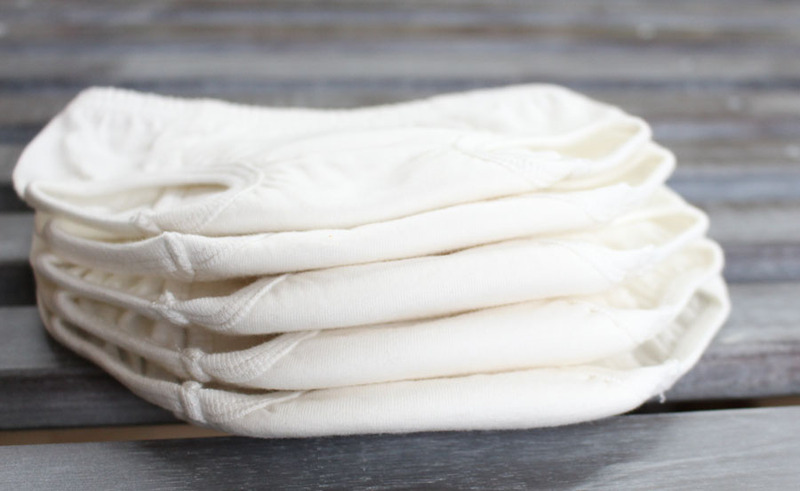 •With my first I used cloth at night 0-4 months, 5-8 months used disposables at night, 8-26 months used cloth (wool cover with hemp/cotton prefold) at night, then ended it all with one night naked in a footless fleece pajama. •With my second I used Seventh Generation disposable diapers at night her babyhood up until she was dry at night at 26 months (same time as my first). •With my third we've used Seventh Generation diapers his whole life up until recently. We took him out of them at 22 months because he was dry all night, but that backfired. He began having nighttime accidents again, so at 25 months we put him back in 7th Gen. And they were dry every night once more. (Ironic?) Now at 29 months we have him in a TinyUps cloth pullup cover with nothing under it, and he remains dry unless we put him in Undies (which he will immediately wet). •With my 4th, who is now 12 months old, we've used a Seventh Gen disposable at night his whole life thus far. In months 0-4 he was always dry when he woke up, and we coslept, so I would potty him in the top hat potty and put him back to sleep, dry and comfortable. Nowadays if he wakes up wet, I change his diaper and do not potty him at night. If he wakes up dry, I don't mess with him and I put him back to sleep. Then, either way, like clockwork, first thing in the morning he wakes up dry and pees on the toilet. Like Cooper, he resists peeing in the disposable because it is Seventh Gen (they aren't that wicking). This works for us, and we re-use a lot of diapers. I am certain that by 24 months we will no longer use diapers at night, although I'm hopeful that he'll be dry sooner. If not, we have a back-up to help everyone out. Daytime with Branson currently looks like this: now that he has mastered walking, I've changed him to a daytime back-up of a TinyUps cloth pull-up cover, below his pants, at home. On outings, like waiting in the car line for my 2nd grader with 3 kids en tow (hopefully napping), I use a disposable. If he signals to poop while in the car, like he did just yesterday, I will open the minivan door on his side and use our Potette Plus (with reusable rubber insert) to have him finish in there, will put all the poop inside that disposable diaper, will wipe the potty out with wet wipes, wrap up the sposie, and put it into the cleaned-out potty for the ride home. At 13-15 months of age, I will like switch to a Tiny Trainers/TinyUps backup for naps during the day. At preschool (which starts next week), I'll send him in a disposable until he is more reliable//signaling, at which time I'll send him in trainers/covers (hopefully around 13-14 months). By 15 months of age, I'd like to have B in Tiny Undies daytime, diaper at night, Tiny Trainers during day naps and on outings. Wrapped up completely by 18 months at the very latest, even if we have to do a potty training experience at the end to wrap it up for good. What are my daytime backup options, again? Cloth diaper, sumo-style cloth diaper, disposable diaper (Seventh Generation), Tiny Trainers or Tiny Undies (with or without a pullup or snap cover), commando, or pantsless for a little bit (as a strategy). What are my nighttime backup options, again? The same as the above, except with a wool cover over a cotton/hemp prefold for heavy wetters. When can I stop using daytime diapers? When you and your baby are reliable with poops ("poop-trained") - or you think ditching them will seal the deal with poop - and/or when YOU (the parent) are finished with using diapers. This could range from 5 months to 20 months. I suggest doing this by 14 months old in the daytime. 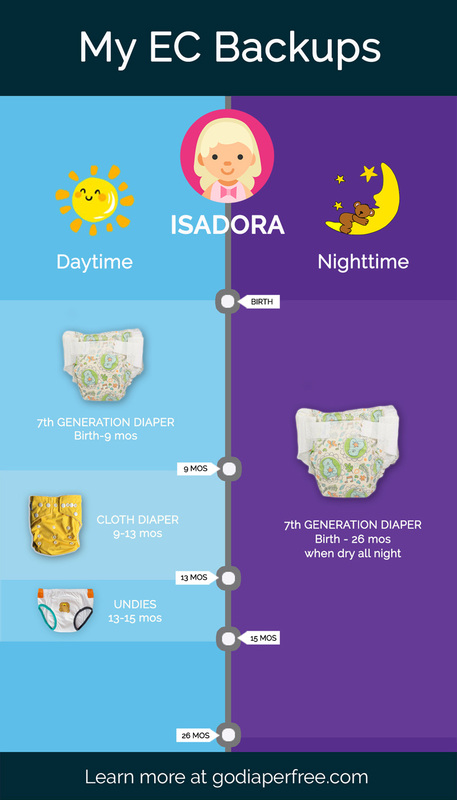 When can I stop using nighttime diapers? When your baby is coming up dry, or when you are ready to night potty train which usually looks like waking baby for one dream pee around 10pm-12am at night, and baby is remaining dry til the morning. This could range from 14-28 months. What to use after daytime diapers? 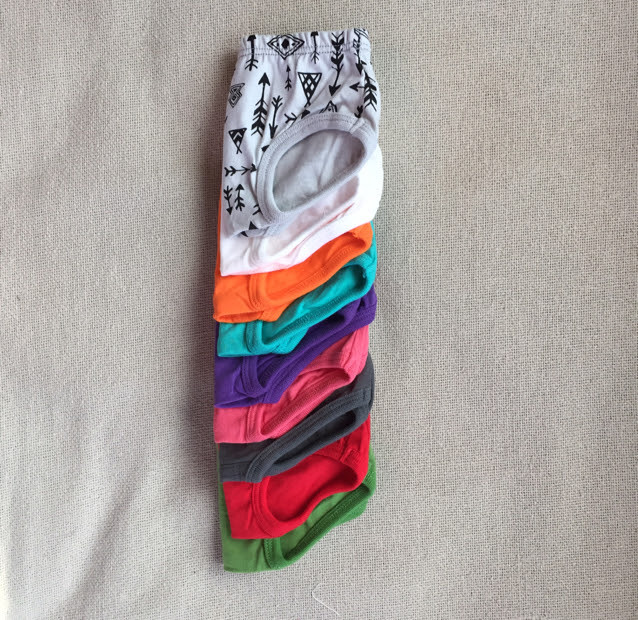 Tiny Trainers or Tiny Undies, with or without a cloth pull-up cover like TinyUps, or go commando or pantsless as a transition to trainers or undies if need be. This typically goes: trainers when walking, undies a few months after or if trainers aren't effective, possibly with a commando stint in between if you need a transition phase. What to use after nighttime diapers? Tiny Trainers or Tiny Undies (with or without a pullup or snap cloth cover), fleece footed pajamas (naked or undies or trainers inside), commando, or naked are your choices. What to use during potty training? Tiny Undies - they feel the least like diapers and are easy to pull up and push off. Get the LEARN line if you want the type of Tiny Undies I've made that help your child self-dress in an average of 10 seconds. When to start using Trainers? When you need an extra layer of protection (ie: you're busy, you're out and about, you're learning your baby or vice versa, baby is sleeping, baby is still having too many misses/accidents for your sanity, to protect floors/pants/etc.). As early as during diaper-free observation time with a newly mobile or newborn baby, when poop-trained (or to help poop-train) with a mobile baby or toddler, when baby is pulling to standing/creeping, when baby walks well and is past that intense developmental milestone, ready to learn. When to start using Undies? Same as with trainers, but when you don't need that extra layer of protection, or when you think it will intensify the learning process (cause and effect!) and benefit baby by feeling less like a diaper, and when you are done with potty training. (from trainers, above): As early as during diaper-free observation time with a newly mobile or newborn baby, when poop-trained (or to help poop-train) with a mobile baby or toddler, when baby is pulling to standing/creeping, when baby walks well and is past that intense developmental milestone, ready to learn. When to start wrapping up EC? When baby is walking well, begin wrapping it up (obviously, it's going to be gradual). So, when baby walks, start to equip her with the skills to take over and be independent. When to use a waterproof cover over trainers or undies? When your child is in another person's care and isn't completely telling everyone they need to go yet (like daycare, preschool, Grandma's house), when you are on an outing, when you are busy and you don't want to have to change pants, socks, shoes, and training pants (my trainers do hold a lot of pee, but the pants always get wet), when it's essential/ much more convenient to have a cover over the trainers or undies. When not to use a waterproof cover over trainers or undies? When you want your child (and you) to get the best learning possible. From 12 months and over, using trainers during the day, at home, it is best for there not to be a cover. When to have your baby help change wet or soiled bottoms? As soon as the child is able, usually around 8-10 months of age, have him or her put the wet ones into a bin and try to pull dry ones on. Use a low bench for self-dressing. Invest in LEARN trainers or LEARN undies to encourage self-dressing. Babies can help much sooner than you'd think! Full instructions in my potty training book. How do you pack for daycare after you switch to cloth or trainers or undies? Put at least 3 of your backup of choice, plus one extra snapping or pullup cloth cover, plus a gallon-sized ziploc bag, plus 2 pair extra socks and 3 pair extra pants, into one of my wet-dry bags (the front pocket) and ask your caregiver to put any wet ones in the larger back pocket of the bag if necessary, plus provide a toilet seat or mini potty if they need one. Which back-up do you use? Anything I've missed? What works for you and your baby, currently? 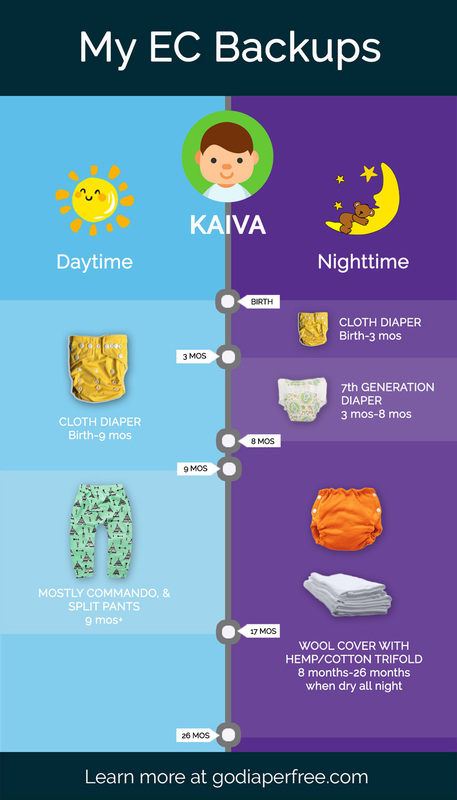 For those who are new to cloth diapering and overwhelmed by all the terms, here are some basic definitions. Pocket Cloth Diaper= Has a pocket between the outer waterproof cover and the inner layer that touches Baby. The pocket can be stuffed with an absorbent insert. You can see more about my favorite types of cloth diapers for EC backup on my EC Peesy blog. Hey Heidi! Thanks so much for sharing your cloth diaper definitions with us. I know that I’ve personally found it so difficult to navigate all of the options – this makes it so much more crystal clear. I’ve been waiting excitedly for this post for weeks! Thanks again Andrea. The prefold cloth diapering method you recommended has worked great so far and was way less complicated than I was concerned about when he was new. Doing EC definitely makes cloth diapering easier as there’s way fewer poopy diapers! We used ClothEez prefolds while he was little and peeing so often but I actually like the thin and less absorbent Organic Gerber inserts since he’s been mobile since they’re trimmer and (hopefully) have helped him notice the wet sensation more clearly. We’re at 10 months and ready to switch from diapers to trainers and see how it goes. Will report back! My baby is 13 months, not walking yet, and I’ve been feeling a little lost on our EC journey lately. This post was incredibly helpful in showing the way forward, thank you! We use Grovia prefolds (no cover) as backup at home during the day, and Tiny Trainers when I am more available to tune in to baby’s cues, but I believe it’s time to go full-time with the trainers. Thanks so much for the amazing work you do! This post came at a great time for me! At 6 months, we’re currently using a combination of cloth with insert on top and Honest Co disposables. Disposables at night and for outings (or for when I can’t be as responsive to baby), cloth the rest of the time. I feel like I’m doing fairly well at catching his poops (his poop signal is mostly just grunting while breastfeeding), but the pees are all over the place. I will sometimes go through three cloth inserts in 40 minutes because he pees in the diaper, cries and crawls to me, I take him to the potty, he squirms away and doesn’t pee, so I put him in a diaper with a new insert, and then it feels like 15 minutes later we do the same dance again. I don’t know if I’m just not seeing his signal and responding soon enough or what… but it feels like diaper free is forever away and I wasn’t sure how or when to start transitioning him. I think what I will do is get some tiny trainers and see if we have any better luck with those around the house for stronger signaling. Thanks!! Thank you for this post! We have recently transitioned to almost full time Tiny Trainers with or without TinyUps during the day. We only resort to our usual prefold cloth diapers when we run out of trainers! (Our daughter keeps growing through the sizes and my budget can’t keep up quite fast enough to have enough in stock). She has been poop trained from very early on but success with peeing varies hugely based both on her and on our ability to focus on her on any given day as we both work. However, I believe that the introduction of TinyUps has increased our success as I think a big part of our misses is my anxiety and therefore over-offering! When the TinyUps are protecting I am calmer and can rely on my intuition more and that has actually made a difference. We have also been able to use the Tiny Trainers – TinyUps combo for outings and she stays dry a lot of the time until we can potty her while out or upon return home! At night we still use prefold cloth but I think we are actually ready to go to the same successful combination as she stays dry most nights or signals quite clearly in her sleep. Not sure when we will go to Tiny Undies as this works for us for now… Our daughter is 10 months but is delayed with the mobility and cognitive markers you mention for her age as she has Down syndrome. So she is figuring out the whole mobility thing but not quite yet crawling, and I’m sure things will change yet again when she crawls. I’ve got a 9-day-old and at the moment enjoying just having in him in my arms with a burp cloth slipped between his legs. :) Once he’s a bit bigger we’ll probably mostly use diaper belts with burp cloths/prefolds and assorted cloth diapers. Currently using disposables with my 1 year old and planning to switch to tiny ups/trainers within the month and wrap it up by 18 months. We have been doing EC since 6 weeks. I always wanted to try cloth but never have except for sumo style. My third baby is now 6 months old, and I had tossed around the idea of EC when I was pregnant and just haven’t made it work. I just signed up for your challenge week, and I am going to try and give it a go! I have used cloth diapers with all three babies. My first showed interest potty training at 2 then it was such a struggle by 2.5 that I gave up until after she was 3. She had so many accidents and troubles that I was so frustrated I said I wouldn’t potty train my next kid until she was 10 lol. Enter baby #2 who at 17 months was wanting to be on the toilet. So I bought your potty training book and she was easy breezy to train at 19 months. She has some accidents but overall it was a great experience, she’s now 2.5. Now my boy is 6 months and I’m feeling like I should have done this from birth :( Oh well, no time like the present right?! Thanks for such an informative article! You’re the best, Andrea! Thank you for all that you do to help us!! I have 4 children (ages 15, 13, 11, and 7 months). I’m finding that my parenting style with our “surprise” baby is way different than when the older three were babies. For one, she’s the first baby I’ve cloth diapered, and she’s the first one with whom I’ve considered using EC. I signed up for your Tuesday morning class! I can’t wait to learn more. We’ve caught a few poos and pees just from noticing cues, but I’m ready to be proactive. So excited! We are using Tiny Ups with Trainers for my 11 month old daughter who stands well but is not walking yet. Makes it easy to get her on the potty quickly which means I offer the potty more. Thanks for rolling out these blog posts and products exactly when I need them! Thanks for the help in figuring out what we need to get started! Thank’s for this great post. have read it several times. also if it made me jump, because my little boy is having his first birthday soon and is gooing through theething and learning to walk and we hade an unbelivebal messy period, where nothing worked… so to think about to ditch diapers was just scarry. now, we are back on track with most of the pees, but not really with the poos … (which went so well before we crushed in to this development step). So I decided as soon as things get better again, we do the same. Well, we did and the success is amazing! I still use diapers at night time or nappies in bed or on long outings, where we have difficulties with finding toiletts. but the truth, we barely need them!!! It’s just amazing. So at home or on walks or small outings he is now in normal cotton underwear. And the diapers are more for me, staying relaxed when we are on longer trips. as soon as I get even more brave, we might ditch the diapers for good. And yes, I need normal, industry, but organic diapers. They are filled with cotton, so the sensation of getting wet is there. Just in case somebody is curios. In our difficult phase I also followed an advice of Andrea (in an older post or maybe the EC-Book). stay put and offer to regular times. Oh, and I had to learn, that sometimes my boy has constipation (always when teething), so then I prefer to help him with some harmless medication, so he doesn’t associate pooping with pain. Well, wanted to share this, maybe it will be helpful for someone. And thank you Andrea for your amazing work! I hope so many people will find you and try this way. I think it’s no only about pee and poop, it’s about communication and taking care. Love how much self love you have with ec and making it meet y’alls needs as a family. That really helps me calm down about everything not being perfect. Such a great thing to do for little ones. Thanks so much for the work that you do and you are making a difference! You really are an expert.